This December brings to a close another successful semester of the Yale Indian Papers Project’s Native Internship Program. 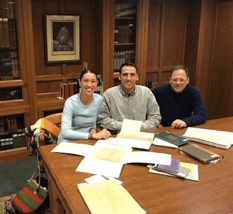 This year’s interns, Eric Maynard (Mohegan) and Danielle Hill (Mashpee), assisted the Project with document transcription, metadata development, record creation, and various other aspects of the scholarly editing and publication process. Last week Danielle made the journey from Mashpee, Massachusetts to the Yale campus in New Haven to visit with Project editors but also used the time to view selected Native materials at two of the University’s Libraries. Mike Widener, Rare Book Librarian at the Lillian Goldman Law Library, put together an assortment of Native American legal materials for us to look through — among them, law texts from the Cherokee, an original Choctaw Protest text, and Muscogee Nation session laws written in the Creek language and several manuscripts dealing with the Herring Pond Wampanoag, a community near to and culturally affiliated with the Mashpee. One such manuscript was an eyewitness account of the theft of an Indian canoe that was sworn in open court. The other two items were sentencings of Indian men. In one case, the defendants were found guilty of stealing a lace handkerchief. In the other case, three defendants had been convicted of the theft of goods cast off from a shipwreck. All four were sentenced to bond slavery. Currently, these materials are being processed for review by Herring Pond Wampanoag tribal representatives before being made publicly accessible on the Project’s Native Northeast Portal. 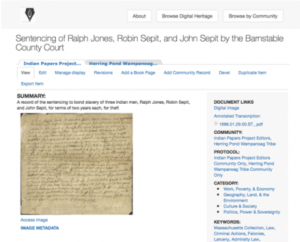 Their inclusion in the YIPP corpus serves to not only highlight the richness of the Law Library’s holdings but together with materials from other contributing institutions they expand the Project’s extensive collection of legal materials. 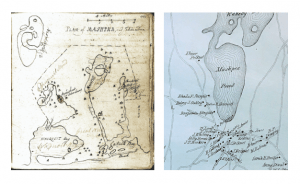 The original intent of the visit to the Beinecke Rare Book and Manuscript Library was to view some of the Ezra Stiles Papers, in particular, some of his mid-18th-century maps of Mashpee (far left). This collection, however, is being conserved and is temporarily unavailable for viewing. 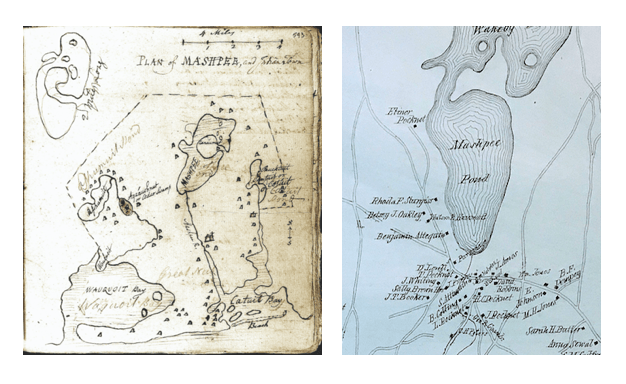 Instead, we examined an 1880 Town of Mashpee map (detail, left, in blue), which differs from the older plan by including Mashpee community members’ named home sites. 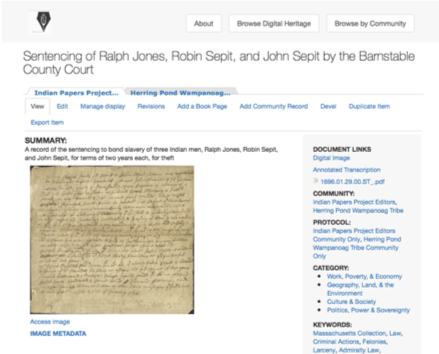 These features can be a very helpful resource while reading the Portal’s Mashpee collection of documents.